After some years in the making, the Oceanic Art Society website is now up and running. This will change the nature of the organisation. While to date the primary mode of communication with members has been through the pages of this Journal, and previously the OAS Newsletter, increasingly it will be through the website and a whole new world of opportunities suddenly open up. The website will give members access to all past Journal articles and reports; extended versions of some articles and links to many other sites – from museums and art galleries, to international exhibitions, dealers and collectors. We will also be able to better serve the educational dimension of our mission of furthering the understanding and appreciation of Oceanic Art by engaging with a younger generation of enthusiasts. We aim to inspire and excite students and young people from both Western countries and the Pacific island nations, where a process of cultural revival is underway and the thirst for knowledge is palpable. Many new visitors will not initially be members but they will still be able to access much information to see just how rich the field of Oceanic art is. This should attract new members, strengthening the organisation. Only members will have internet access to the most recent issues of the OAS Journal. Hopefully this arrangement will provide a strong incentive for existing members to remain financial and new members to join, while still allowing casual visitors, such as students, access to much that will hopefully whet their appetite for this fascinating realm of human artistic endeavour. The website will increasingly become a portal for those interested in Oceanic art, wherever they may be in the world, to engage with their broader community, and with specific individuals through online forums and special interest groups as well as our regular guest speaker events and the annual forum. A garra from the Hunstein Ranges at Parcours, Paris, 2016. Special thanks must be given here to Andrew Drane, the web designer responsible, for his painstaking work and patience in bringing this long, and at times complicated, process to fruition. Thanks also to all the OAS committee members who contributed their time and effort to this end. I would like here to send out a request to members for suggestions on how the website might be improved and what sort of content members would like to see in the Journal and on the website. As editor I am dependent on receiving articles and reports that can be published. We are always interested in receiving contributions — whether from experienced writers or those who wish to try their hand for the first time. We also welcome member suggestions on ideas for articles; on books to review; or for individuals to be interviewed. 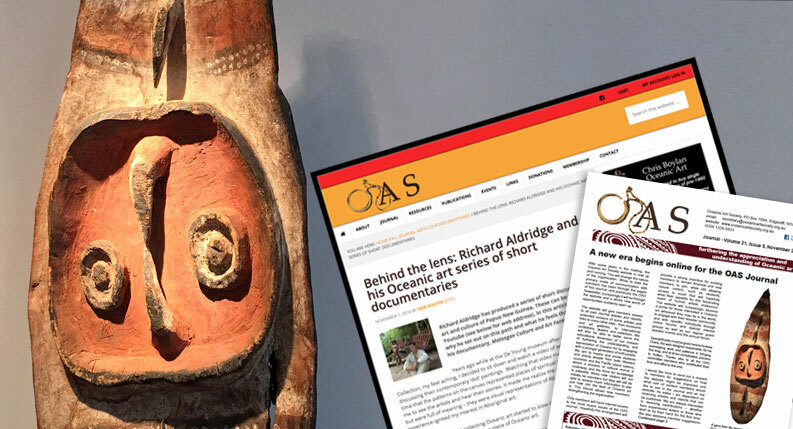 With the launch of the new website, members should look at the OAS Journal as an interactive space where they can directly participate, adding their energy and knowledge and thereby strengthening the Society and enhancing its important role of celebrating Oceanic art. This is the last edition of the OAS Journal for 2016 with the final end of year lecture by Crispin Howarth at the Middle Harbour Skiffs Yacht Club, Mosman NSW straight after the Annual General Meeting at 10.00am on Saturday, November 12. The annual OAS luncheon is to follow at Skiffies restaurant – at the same club. A carved board from the Fellows collection, purpose unknown. Image courtesy of the National Gallery of Australia. Crispin’s lecture is on the National Gallery of Australia’s Reverend Fellows collection of Massim artefacts, which promises to be a treat. We will be privileged to again enjoy Crispin’s inimitable presentation style and are sure to see new and unusual artefacts from this famous collection. At this point I would like to thank all the 2016 speakers who have taken the time and effort to prepare their talks for the benefit of members. These talks always bring a sharp focus to one aspect or other from the very wide range of topics and subjects that fall under the remit of the Oceanic Art Society. Jude Philp’s wonderfully incisive talk on some of the lesser known artefacts held by the Macleay Museum was a case in point. Her presentation on September 14 was held in the Macleay — an artefact in its own right — and allowed the history of the institution to unfold through the particular stories of some of its objects and how they were acquired. We hope that these talks will be able to be filmed in future and posted on the website so that they can be enjoyed by members wherever they may be in the world. In closing I would like to wish all members the very best for 2017 and I hope that you engage with the new website and that it enhances the enjoyment and knowledge you derive from your membership of the OAS. Dr Jim Elmslie, political scientist and Aboriginal and Oceanic art dealer. 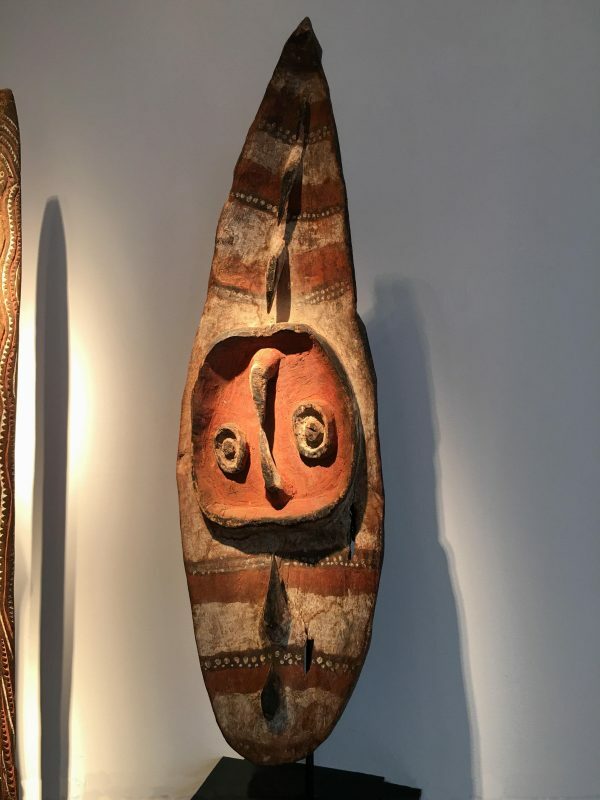 He is currently Visiting Scholar and Co-convener of the West Papua Project at the Centre for Peace and Conflict Studies at the University of Sydney; Tribal Art Specialist at Theodore Bruce Auctions, and editor of the Oceanic Art Society Journal. He has been visiting the Sepik Region of PNG since 1985 and built and ran a safari lodge at Tambanum Village from 1986 to 2004.